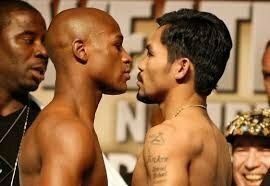 Floyd Mayweather and Manny Pacquiao have finally met in person. And now talks might get serious about meeting in the ring. According to the Top Rank promoter Bob Arum, the proposed fight is scheduled for 2 May. Mayweather and Pacquiao were both sitting courtside, directly across from one another, at a Miami Heat basketball game on Tuesday night. 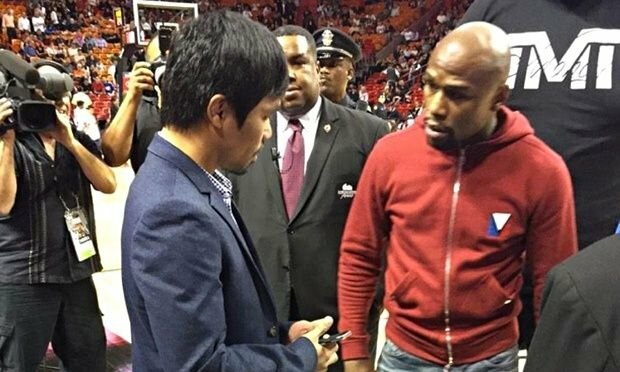 Mayweather went over to Pacquiao at half-time, the men shook hands and chatted briefly, then exchanged phone numbers. Asked to clarify if the exchange meant the two fighters would negotiate directly about meeting in the ring, Pacquiao said that was the case. Mayweather did not respond to questions. “Not now,” one of his security guards said, as Mayweather fiddled with his phone.